The lovely appeal of your garden furniture located in a stylish section with well-done lawns and blooms makes your home have the appeal of a real paradise. The wooden garden furniture makes you miss the next weekend so that you can invite friends to a barbecue. However, the outdoor environment can take a toll on the future and make it lose the original appeal in no time. From the extremely low temperatures of winter to the hot weather in summer, you can only be assured of the extended attractiveness of the furniture by caring it appropriately. Here are some useful tips to help you. After unpacking the outdoor reclaimed wood furniture, it is advisable to treat it with oil before installation. Though the wood was already treated by the manufacturer, it is difficult to know how long it had taken in the store. Therefore, the original treatment could be weak already. The only way to ensure that the wood is in top shape is treating it again. Unlike the modern living room furniture, the antique outdoor furniture might have taken longer in the market and a new treatment would come in handy. Make sure to oil all parts including the hidden areas around the joints and crevices. Unlike the indoor furniture, the wooden garden furniture is likely to attract dirt fast. Dust, pollen, and falling leaves are likely to fall into the furniture surface making it dirty. If this dirt is not cleared fast, it can corrode the wood and make the furniture unsightly. It is important to ensure that the furniture is cleaned as immediately as it gets dirty. Consider dusting the furniture every day and cleaning it thoroughly at least once every week. But this is not enough. You also need to occasionally oil the furniture. 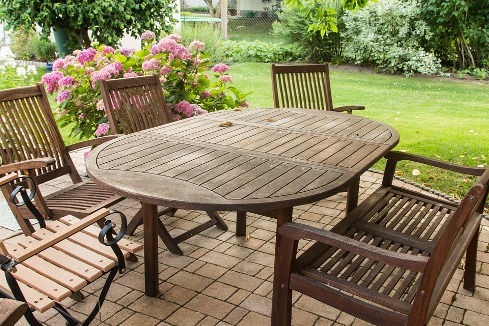 The best schedule to oil the garden furniture is after major seasons such as summer and winter. · Wash the furniture thoroughly using wood cleaner. · If the dark spots are still visible, was the furniture with a strong liquid chlorine solution. · If chlorine treatment fails to clear the dark spots, consider scrubbing with sandpaper and then apply a layer of finish. When wood furniture is left out to battle the elements of weather, alternate cold and hot seasons can cause the joins to loosen. Loose joints can also be caused by regular use of outdoor antique furniture. Make sure to check the state of the furniture regularly to note the need for retightening or repairs. Such retightening should be done immediately to prevent the problem from deteriorating. If you are unsure of how to handle such retightening or minor repairs, consider working with an art décor furniture expert for assistance. When the cold and hot seasons interchange, your furniture tearing accelerates at a fast pace. However, you do not have to watch the high-value British furniture fade under the heavy impacts of natural elements. Consider covering the furniture with PVC backed polyester material. The cover should be waterproof and also feature breathable openings to reduce the danger of molds development. Note that the covers should only be used in extreme weathers such as very hot days, cold season, and at night. However, you should allow the furniture to remain open and give the garden a paradise appearance.